The Kayalu Claws-All™ is a stable and versatile gear-mounting tripod platform for boats, kayaks, automotive, aviation and all-terrain applications. The Claws-All is assembled by Kayalu using components manufactured by RAM Mounts, market leader in mounting solutions for use in outdoor, demanding environments. This Claws-All model, the KCA-5800-BS, sports a 1" diameter RAM Mounts "B" ball on its upper plaftform capable of supporting B-size arms and gear. This Claws-All model includes 3 power-locking suction feet, capable of mounting the Claws-All securely to any non-porous surface (i.e. plastic, glass, gelcoat, etc.). 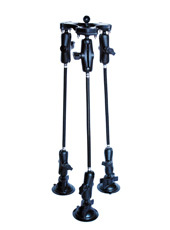 This Claws-All model stands 23" (59 cm) from suction cup to upper platform. Each of the Claws-All's three suction feet can be independently oriented to mate to a gently contoured surface, such as a kayak deck. 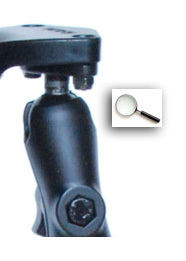 With it's three slim, stainless steel leg extensions, your fishfinder and other gear are provided height and stability like no other mount engineered for active uses.